“Rent Space” From the Ceiling By Adding Crown Moulding – You may have heard that crown moulding makes a wall look shorter because it breaks up the wall below where it meets the ceiling. And this is true. 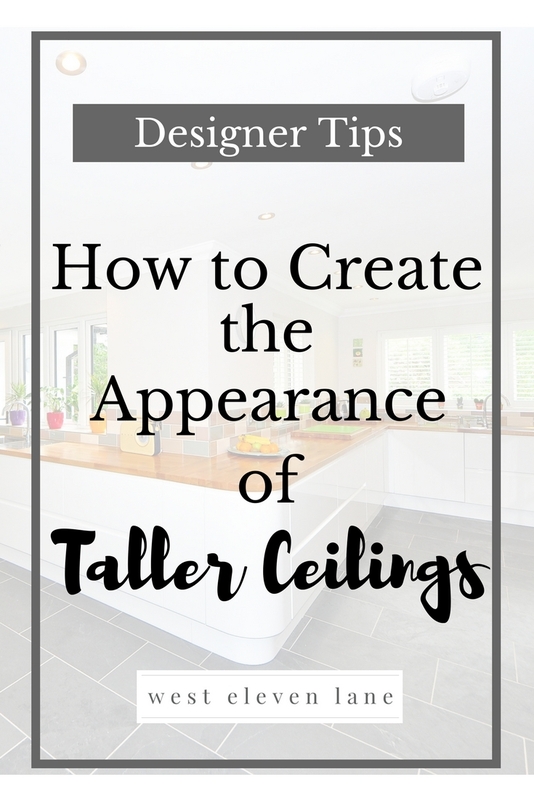 The trick is to paint the moulding the same color and sheen of your walls, thereby “renting space” from the ceiling and drawing the eye upward for the illusion of taller ceilings. Complete the look by using a ceiling shade that is two steps darker than your wall and moulding color. Install Darker Crown Moulding – I have seen this pulled off in an overly cave-like entryway. There’s nothing more uninviting, really. Crown moulding was installed surrounding the entryway ceiling and was painted a darker color, again giving the illusion of a taller ceiling. Add Vertical Stripes – In fashion, we know ’em and we love ’em. In interiors, vertical stripes can create a very similar slimming and lengthening appearance. Utilize paint or wallpaper for a dramatic impact on any wall. Paint Soffits the Same Color as Your Cabinets – This is something we were dealing with when we purchased our home earlier this year. The kitchen cabinets were oak and the soffits above them were navy blue. By painting both the soffits and the kitchen cabinets a bright white, we have achieved the look of a much grander and taller kitchen space. Remove Bulky Hanging Light Fixtures – In my opinion, nothing makes a ceiling feel more like it’s crashing down on you than a bulky ceiling fan, for example. Switch out your fixtures with streamlined recessed lighting for a more airy feel. Create a Floor to Ceiling Display – Draw the eye up with displays such as built-ins or free-standing bookcases. Artwork hung on a vertical feature wall that is outlined with narrow moulding might be my current favorite way to achieve this look. Paint Walls and Ceilings the Same Color and Shade – This “erases” the seams and tricks the eye into thinking there are no edges…and therefore no end to your walls. Think Diagonals – Some say this can be achieved with furnishings, but I think it’s easiest to stick with wall coverings. Have you ever noticed that a diagonal line can make an area appear extended? Again, achieve this with paint lines or wall paper. Hang Drapes Floor to Ceiling – I have a lot more to say on the topic of drapes, but for now…please, please, please don’t even consider ordering those 84″ panels. You are missing out on a major design impact opportunity. And before you drill any holes, compare the look of panels hung at the top of your window casing to the look of them hung just below the ceiling. I promise the difference is impressive. Select Furnishings with a Shorter Footprint – Just as it sounds, stick with the shorter chairs, couches, kitchen tables, etc. The more length of wall that is visible, the better in terms of lengthening it. Are you ready to tackle one or more of these tips? If you are, you may find that suddenly you have yourself a little more breathing room 🙂 Let me know how it goes!